We love chili around here. I crave it whenever the weather outside gets overcast and cold. The recipe I normally use, I got from my friend Diane years ago. I like it because it's simple. I brown a pound of whatever ground meat I have around (my favorite is turkey or chicken) with a chopped onion. When the meat is done, I dump in a can of hot chili beans and a can of either Rotel tomatoes, or just plain canned tomatoes. I can make it feed more people by adjusting the number of cans of beans and tomatoes. Then I just let it fester on the stove for however long I can stand to smell it and not dive in! If I had one criticism of the recipe, it would be the thickness. Sometimes I add a cornstarch slurry after it simmers for a while in order to tighten it up a bit. I have also used equal parts flour and butter. Both thickening methods work fine. 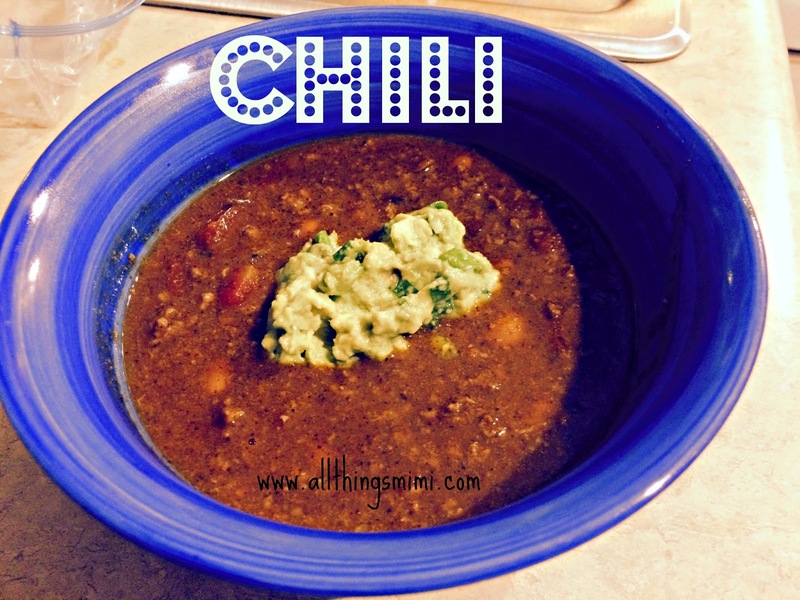 I was wandering around on Pinterest a few days ago, and I came across a blog entry on one of my favorite blogs, "Food Pusher" about making chili mix at home. I know a lot of people buy the packets of chili seasoning mix at the store. But I also know most mixes like that are full of preservatives, and mostly just salt. I was very curious to see if the recipe for chile seasoning on Food Pusher would taste decent. I was hoping it would. I was thinking I could frankenstein the two recipes together to improve my own chili recipe. It was a rousing success! I followed the Food Pusher recipe with the following exceptions..... I did not have dried basil (because I find it pointless), so I left it out. I used a can of fire roasted diced tomatoes instead of tomato sauce, and I used a can of chili beans instead of regular beans. I also used slightly less water because of the juice in the can of tomatoes. As you can see in my crappy photo, I garnished mine with some guacamole. Because I could. You could also add chopped fresh cilantro, diced onions, sour cream, crushed tortilla chips, or whatever you want. While I doubt I will make up the chili mix in advance (it's just as easy to measure the spices directly into the chili), I think the flavor profile was spot-on! I did add additional hot sauce to my bowl, so I might add either some chipotle powder or maybe even a diced chipotle pepper to the mix next time. Do you have a favorite chili recipe you use all the time? If so, share! I'm always looking for ways to tinker with my repeated recipes to make them better!